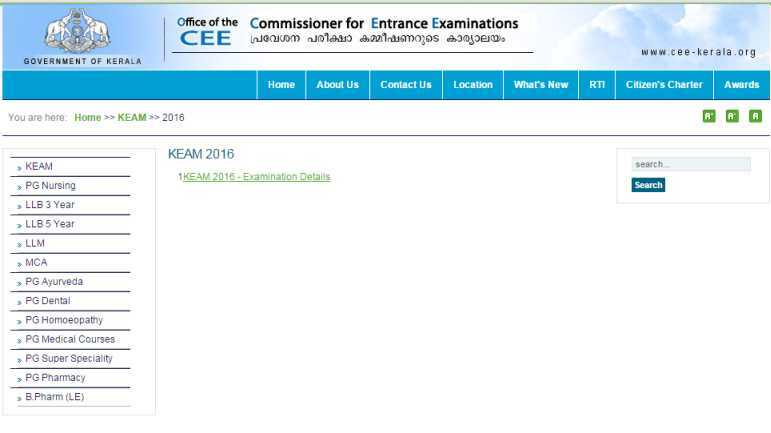 I want the admit card of Kerala Engineering, Agriculture and Medical KEAM exam of CEE Kerala so can you please provide me? Kerala Engineering, Agriculture and Medical KEAM is a state level entrance examination conducted by Commissioner of Entrance Examination CEE Kerala for the admission to various colleges and institutions located in Kerala state for UG programmes. The KEAM exam will conduct on 25th to 28th April 2016 and the admit card will be available before 15-20 days of exam so yet the admit card is not available. Here I am tellling you the process to download the admit card of this exam. Then click on â€œKEAMâ€� and then â€œ2016â€� at the left side of the page. On this page you will get the admit card of KEAM exam when it will publish.